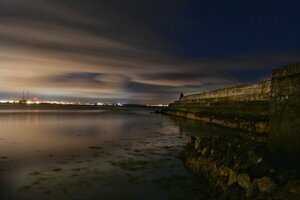 Seapoint east beach, Dublin, last night. Posted in Photography and tagged lights, Seapoint at 9:13 am on March 22, 2019 by Chompsky. Is that the leaking sewerage plant in ringsend, in the background? You’re always such a beacon of joy, dearie! A dose of the owld crypto might make you take water quality a bit more seriously.. A lovely picture cannot cover up the faeces in the water..
You mean you’re not gonna blame the Blushirts? only for their pathetic attempts to sell off a national resource.. Pathetic implies they’re not very good at selling off the resource which, in this case, you’re saying is faeces? oh dear, I must be dealing with one of Phil Hogans underlings..
Hi, The leaking sewerage plant is run by irish water – the pathetic attempt by your fellow blushirts to sell off a national resource – Water and access to same.